Be sure to add me to your favorites list! Sign up for my email newsletters by adding my Store to your Favorites Check out my other items! Thissale is for one uncirculated: ZAMBIA 5 SHILLINGS 1965 INDEPENDENCE COMMEMORATIVE LIMITED MINTAGE COPPER-NICKEL PROOF COIN PHOTOS IN THIS LISTING ENLARGED TO SHOW DETAILS COIN YOU RECEIVE MAY VARY SOMEWHAT FROM THAT SHOWN IN PHOTOS BUT WILL BE IN SAME GENERAL CONDITION THERE IS SOME TONING AND OXIDATION CONSISTENT WITH AGE OVER 40 YEARS OLD Zambia, a landlocked nation in south-central Africa gained its independence from Great Britain on October 24, 1964. 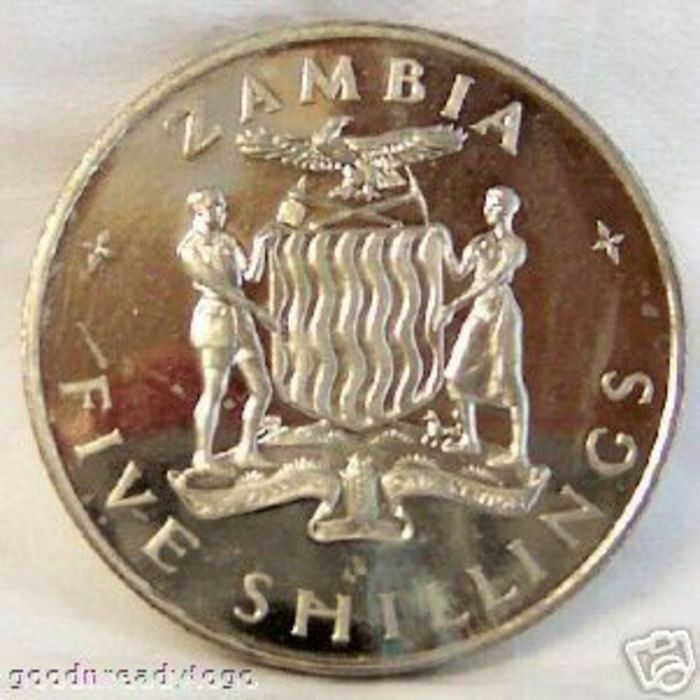 In 1965 Zambia issued a commemorative copper-nickel 5 Shillings coin, struck to commemorate the first anniversary of independence. One side of the coin, struck by the British Royal Mint, shows the bust of the nation's first President, Kenneth Kaunda, a former school teacher and civil servant who helped lead the nation's drive for independence. 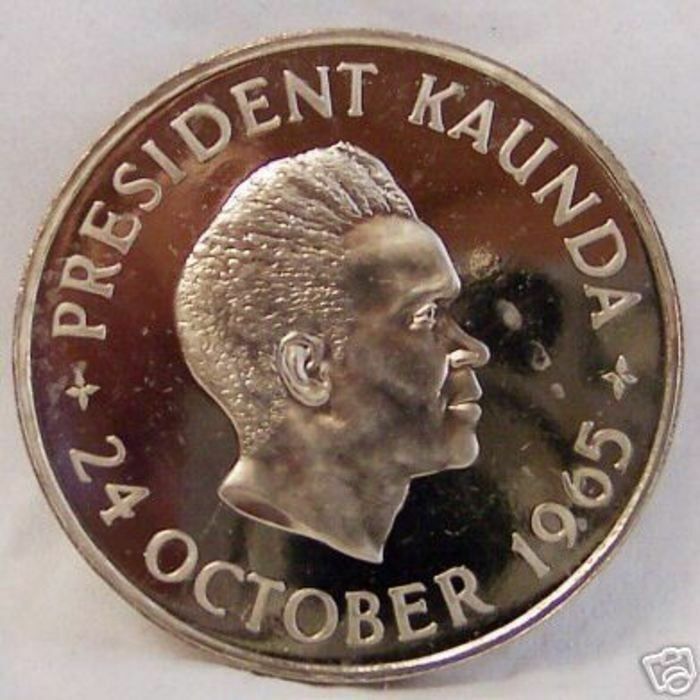 Around the edge is inscribed "PRESIDENT KAUNDA" and the date of the first anniversary of independence "24 OCTOBER 1965". 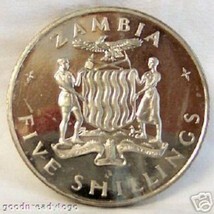 The other side shows the Zambia seal (which includes its motto:"ONE ZAMBIA ONE NATION") and around the edge "ZAMBIA" and the denomination:"FIVE SHILLINGS". The edge is insribed with the national motto and the date of independence. 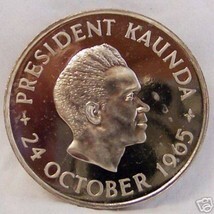 Some of these commemorative coins were struck with REVERSAL of the edge inscription "* ONE ZAMBIA ONE NATION * 24.10.1964." In the correct version (which is the coin being sold in this listing), this edge inscription is right-side up when the Zambia seal side of the coin is facing upward. In the error version of this coin (which is NOT the coin being sold in this listing), with the Zambia seal facing upward, the edge inscription appears upside-down. We carry both correct and error versions of this coin at our Store. THESE COINS ALL HAVE SOME TONING CONSISTANT WITH 40 YEARS OF AGING OF COPPER-NICKEL COINS. THE COIN YOU PURCHASE MAY VARY SOMEWHAT FROM THE ONE SHOWN IN PHOTOS BUT WILL BE IN THE SAME GENERAL CONDITION. THIS LISTING IS FOR ONE COIN ONLY, I.E. THE CORRECT VERSION OF THE COIN ONLY. YOU CAN PURCHASE THE ERROR COIN SEPARATELY AT OUR STORE Diameter of coin is about 39 mm. Total mintage for correct AND error versions of this proof coin is only 20,000. Own this BEAUTIFUL HARD TO OBTAIN COPPER-NICKEL LIMITED MINTAGE PROOF COIN which is of MAJOR HISTORIC SIGNIFICANCE!!! To avoid disappointment, BUY IT NOW our Store Even better own BOTH versions of this coin!!! We also stock the ERROR VERSION of this coin at our store. 100% Guarantee of Authenticity Please be sure to ask questions before bidding so you are completely satisfied with your purchase. PAYMENT and SHIPPING INFO We ship quickly, usually within 24 hours of receiving payment. PAYMENT IS REQUIRED WITHIN 7 CALENDAR DAYS except for Buy It Now items which require immediate payment. We accept PayPal. To pay with PayPal, you must have and ship to a confirmed USA address. Shipping for this item is to USA only. Florida buyers pay 6.5% sales tax. We give feedback on all completed transactions once we know you are satisfied with the transaction and have left feedback for us. Thanks and Happy Bidding!! !